Using a Montessori approach, we teach practical life skills, communication skills, and social skills. 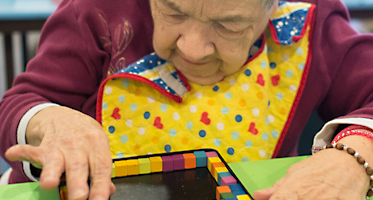 At Quality Connections, we offer a Montessori-based Adult Day Learning Program designed to help the people we serve become more independent in their day-to-day lives. Trained instructors guide participants through hands-on, sensorial lessons for reading, writing, math, and time skills. Music and drama classes are offered daily along with regular outings to a variety of places in our community. We increase independence by tailoring learning experiences to the needs of our clients. Our Montessori-based learning experiences are designed to meet the stages of learning of the individuals we serve. We are committed to providing fun and a positive learning experience for each and every one of our clients.